Whiskas Senior 7plus Chicken is a complete dry food that has been adapted to the unique needs of older cats. With age comes a tendency to rest more and move leΒ, which means your cat's nutrition will also need to change. Whiskas Senior 7plus Chicken is prepared with delicious fresh meat and contains a range of important vitamins and minerals your cat needs for vitality. This kibble also helps support urinary tract function, something that can trouble mature cats. This food is not just highly nutritious – it is also irresistible! Tasty, crispy pockets are packed with a creamy chicken filling that your cat is sure to love. Whiskas Senior 7plus Chicken offers complete, balanced nutrition for older cats, helping maintain health and happineΒ. It contains vitamin A to support vision and vitamin E to strengthen the immune system. EΒential fibre is provided by carrots and peas, which ensure the digestive system can function smoothly. 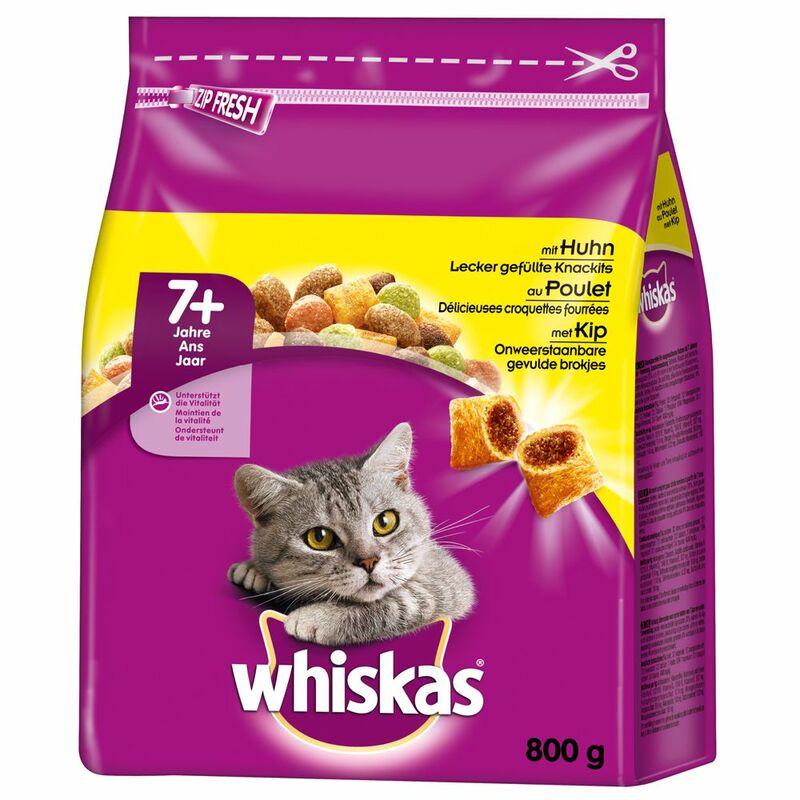 Whiskas Senior 7plus Chicken at a glance: Complete dry food for cats over the age of 7 years Balanced, complete nutrition Tasty filled pockets: crispy on the outside, smooth and creamy on the inside! Minerals: to support urinary tract health Fibre: to keep the digestion functioning properly Increased vitamin A content: to strengthen eyesight in older age Vitamin E: to support the body's natural defences EΒential oils for healthy skin and gloΒy fur Free from artificial colours, flavours and preservatives Practical plastic seal: to keep food fresher for longer.